Leave it to Red Bull, the sponsor of sick crazy sports, to want to host the World’s only on snow truck race at a ski resort. Why not combine snow sports enthusiasts with motor heads as fans to watch a “Frozen Rush” – a head to head snowy truck race on a ski trail? And what better place to host the wild winter truck race than Sunday River Ski Resort in Maine – the same venue where Red Bull sponsors the annual Dumont Cup – a pro am for young free skiers to flaunt their tricks on huge kickers, jumps, rails and quarter pipes?! So the 3rd Annual Sunday River Frozen Rush January 8 2016, Red Bull brought brightly emblazoned trucks, concrete blocks and banners to the slopes of Sunday River – constructing an outrageous off road race course for the best Pro 4 race car drivers to compete before 10,000 fans. 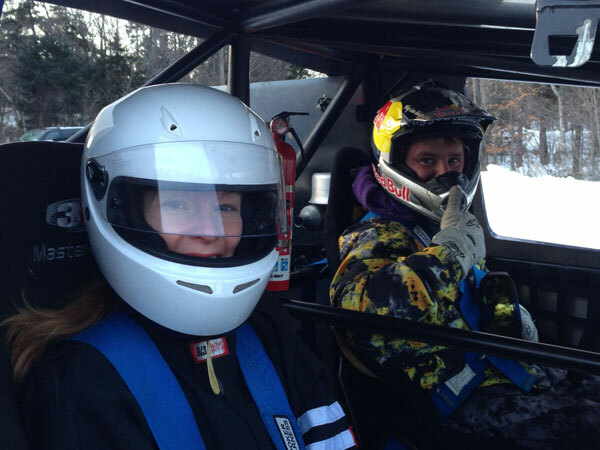 Sunday River hosted the 2nd annual Red Bull Frozen Rush 900-horsepower truck race on their ski slopes Friday Jan 9, 2015 and it was off the map – literally – and on the slopes. 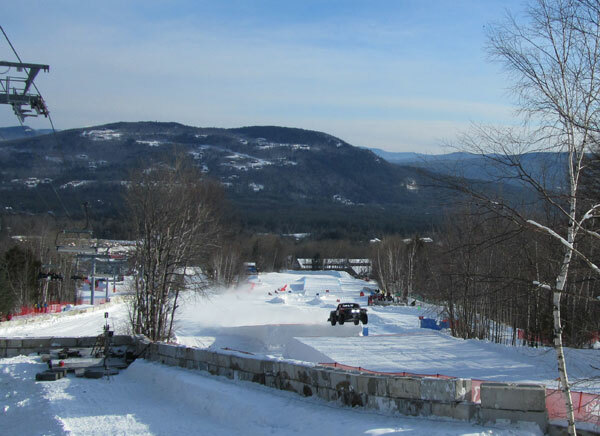 South Ridge at Sunday River was transformed to a wild Red Bull style snow derby course with concrete reinforced berms, hairpin turns and gap jumps for the pro drivers to navigate at speed nearing 90 miles per hour – these drivers are not accustomed to snow. The nine drivers race 900 horsepower customized trucks with spiked 35” BF Goodrich tires. These trucks are super loud and raspy like chain saws, in fact you can hear them all over Sunday River’s slopes during the qualifiers and race. I had the opportunity to ride along in a Frozen Rush truck, it was a ridiculously scary snowy acrobatic ride, we took air, went sideways, I screamed… and I have newfound respect for these driver that reach speeds of 90 mph on snow. Sunday River has a history of zany events co-hosted with Red Bull, dating back to Simon Dumont’s quarterpipe construction in 2008 where Sunday River freeskiing native set the world record ski jump height. The Dumont Cup at Sunday River was hosted in March with Red Bull sponsorship for 8 years. Sunday River’s Red Bull Frozen Rush event is free for spectators, welcoming snow sport fans and motor heads alike.